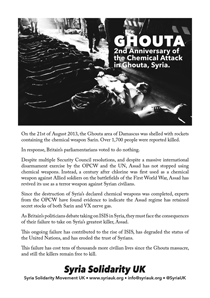 Leaflet for tomorrow’s London event marking the second anniversary of the Ghouta massacre, 2pm at Trafalgar Square. PDF version here. GHOUTA: 2nd Anniversary of the Chemical Attack in Ghouta, Syria. On the 21st of August 2013, the Ghouta area of Damascus was shelled with rockets containing the chemical weapon Sarin. Over 1,700 people were reported killed. In response, Britain’s parliamentarians voted to do nothing. Despite multiple Security Council resolutions, and despite a massive international disarmament exercise by the OPCW and the UN, Assad has not stopped using chemical weapons. Instead, a century after chlorine was first used as a chemical weapon against Allied soldiers on the battlefields of the First World War, Assad has revived its use as a terror weapon against Syrian civilians. Since the destruction of Syria’s declared chemical weapons was completed, experts from the OPCW have found evidence to indicate the Assad regime has retained secret stocks of both Sarin and VX nerve gas. As Britain’s politicians debate taking on ISIS in Syria, they must face the consequences of their failure to take on Syria’s greatest killer, Assad. This ongoing failure has contributed to the rise of ISIS, has degraded the status of the United Nations, and has eroded the trust of Syrians. This failure has cost tens of thousands more civilian lives since the Ghouta massacre, and still the killers remain free to kill. 1. So far this year, the Assad regime has killed 7 times as many civilians as ISIS. 2. Since Security Council Resolution 2139 banned barrel bombs in February 2014, thousands more have been dropped onto hospitals, homes, and schools. Some of these bombs use chlorine gas to add to the terror. 95% of victims are civilians. 3. Assad’s air attacks are a leading cause of Syria’s refugee crisis. 4. Many of the barrel bombs are dropped on areas under siege. More than half a million people in Syria live in areas with no access to food, water or medicine, including the areas of Ghouta that were targeted by Sarin attacks in 2013. 5. The international anti-ISIS coalition is flying in the same airspace where Assad’s air force is attacking civilians, but it chooses not to intervene. Assad’s air force has helped ISIS expand into Syria. His air attacks fracture communities and drive extremism. 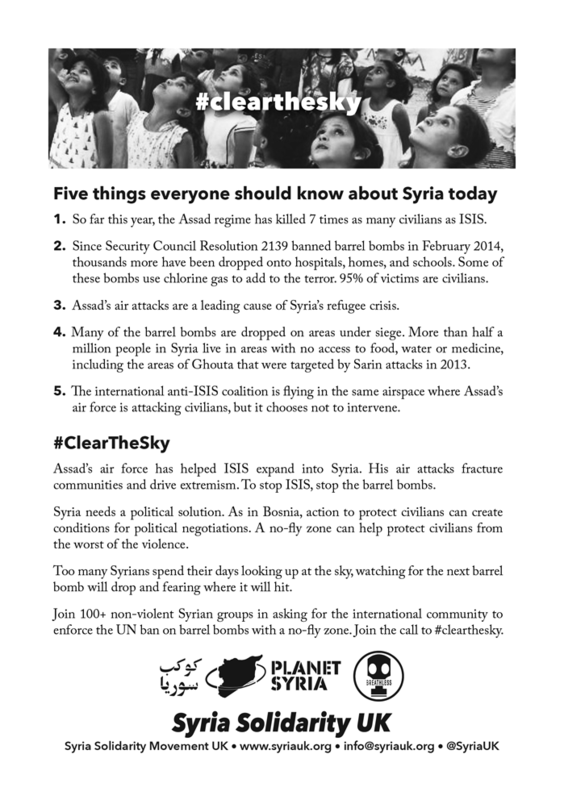 To stop ISIS, stop the barrel bombs. Syria needs a political solution. As in Bosnia, action to protect civilians can create conditions for political negotiations. A no-fly zone can help protect civilians from the worst of the violence. Too many Syrians spend their days looking up at the sky, watching for the next barrel bomb will drop and fearing where it will hit. Join 100+ non-violent Syrian groups in asking for the international community to enforce the UN ban on barrel bombs with a no-fly zone. Join the call to #clearthesky. 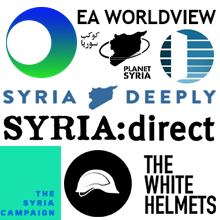 Planet Syria on 5 things everyone should know about Syria today, with sources. Clear The Sky event page on Facebook. 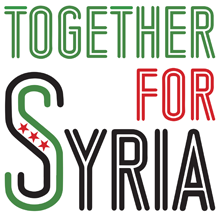 In London, Syrians and their friends will be marking the anniversary with an event tomorrow Saturday the 22nd of August. Assemble at 2pm in Trafalgar Square, before walking to Downing Street. Please bring flowers to mourn the dead. More on the Facebook event page. What’s happened since 2013 in Eastern Ghouta?